Gingered silken tofu dressing is my new thing. I’ve been making it up and keeping it in the fridge for salads and now, dessert. With all the ginger it has no discernable soy taste to me, at least not with the tofu brands I have used like Mori-Nu or Trader Joe’s. I made some today from a block of silken tofu and only used about a quarter of it in this dessert, so there will be more creamy ginger dressing on the menu in the next few days. My last batch kept for four or five days, longer than I usually think of silken tofu dressing lasting in the fridge. Probably the salt and ginger in it helped it keep. The last few days have brought record-breaking heat to Puget Sound. Now hot here is not hot like the rest of the country– we’re breaking records with high temps like 92 and 89. 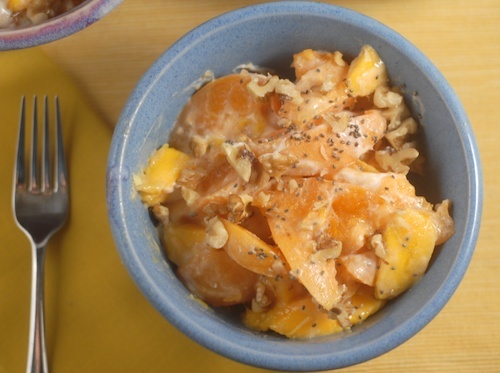 But it’s still plenty hot enough to want to keep the oven off with this raw apricot mango crumble. The quantities in this are pretty flexible. I’d originally intended to make it with half mangoes and half apricots, but in the few hours before I made the recipe two of our mangoes disappeared. They do make good snacks for our young adults. I call this a crumble but that might be a bit of a stretch given that it just has a light topping of walnuts, chia seeds, and raw demerara sugar. Like the rest of this recipe, how much topping to sprinkle on is up to you. Blend the tofu, ginger, and salt in a high-speed blender (you may need to double the batch to get your blender to work properly). Pit and chop the apricots and mangoes. Combine the chopped fresh fruit with the dressing. Sprinkle with walnuts, chia seeds, and demerara sugar for the topping. 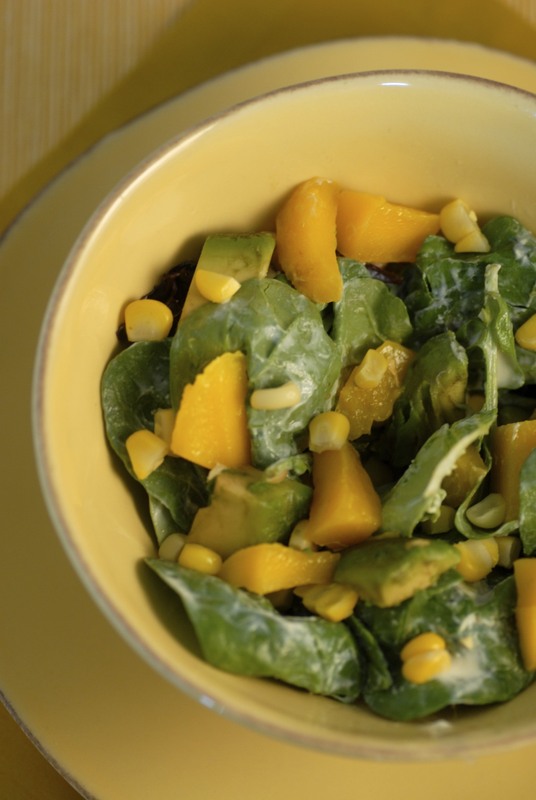 Mango, Avocado and Roasted Corn Salad with Creamy Ginger Dressing Mango avocado salad with roasted corn and mixed greens, optional grated cheese. Inspired by the Don Quixote salad from Mad Greens restaurant. 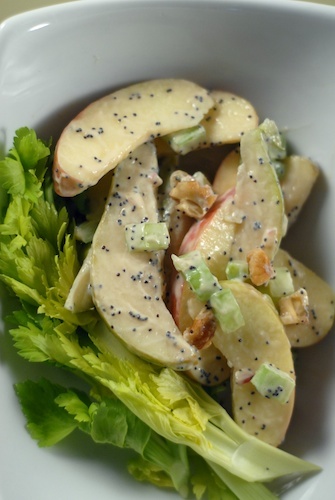 Poppyseed Dressing (silken tofu-based) A quick and easy non-dairy poppyseed dressing made with silken tofu. 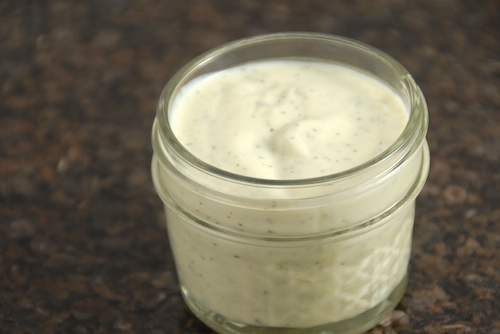 Creamy Lemon Herb Salad Dressing (silken tofu-based) This creamy lemon-herb dressing based on soft silken tofu, olive oil, and lemon juice will be good on any salad and can stand up to hearty winter greens. 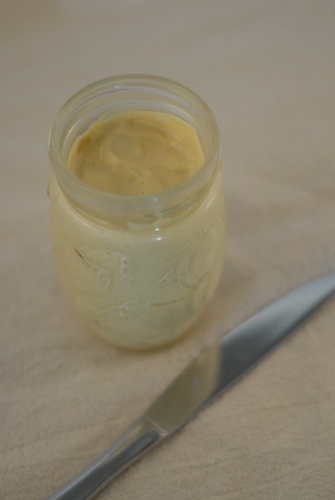 Silken Tofu Mayonnaise A simple, quick recipe for homemade tofu-based mayonnaise. Protein-rich, light and low-cal. What a wonderful dessert. It packs a good healthy source of protein as well. This sounds delicious! I’m the same way – I do NOT want to touch the oven when it gets hot outside. Thanks for the visit and comment, Alex! Ginger is so good with tropical fruits, too, and you’re going to have a good chance to experiment with that! My mother just brought me mangoes. Going to try this! yummychunklet recently posted..Rainbow Connection Cupcakes for International Picnic Day! Oh great, let me know how you like it! Thanks for stopping by and commenting! Such an interesting dessert! So curious what it tastes like! Let me know what you think if you try it. Nice to see you here! I can attest to the heat wave we’ve had here in Washington! And while most of us don’t have AC, myself included, it makes it that much worse!! I do love the warmth though!! This crumble looks DELISHHH I love the tofu addition for some added protein! Yup, it’s easy to think we are just wimps in Puget Sound but when most people don’t have AC it’s a different ballgame! It’s not that much tofu but it does add some creaminess without dairy. Interesting combination of flavors! I wouldn’t have thought to add the ginger in there. Looks good! Thanks, Alex! Fresh ginger goes well with a lot of different fruits! I have been on a ginger-peach-cinnamon kick. This sounds amazing though! I love the thought of mango and ginger… can’t wait to try it out! Ginger-peach-cinnamon sounds good, too, Laura! I love having so many choices of fresh fruit this time of year, we just picked up some peaches today. What a fantastic way to use up some of my silken tofu! And I add chia seeds to everything I can right now. It such an easy way to add some cholesterol friendly stuff to dishes. What a great use of ingredients! Chia seeds and silken tofu are very new ingredients to me but this looks like a great way of combining them. Thanks for sharing – can’t wait to try! Silken tofu makes such wonderful creamy dressings. And I bet the ginger pairs perfectly with the fruit! Thanks, Alex! I’m loving all the fruit that’s available right now and the string of hot sunny days we’ve had recently! Morinu has been such a lifesaver, since it seems indestructible and everlasting in those shelf-stable packages. This is yet another fantastic use for it! All those fresh fruits look so perfectly sweet and refreshing. Hannah recently posted..Yay or Nay?